Your product is made of solid teak wood and is enhanced with our proprietary finish. This finish adds a rich and protective coating and does not require any special maintenance other than an occasional cleaning with a soft bristle brush and mild detergent. When the product is not exposed to water or sunlight it will maintain the same look for many years. Do nothing and enjoy the natural weathering patina that evolves with normal use. Teak furniture when exposed to water and sunlight will slowly fade to a natural silver-gray color. This color transformation does not affect the durability of the teak furniture. Do not consistently leave teak furniture in standing water. If you prefer to keep your teak product at its original color instead of letting it weather to a silvery-grey patina then an occasional coat of AquaTeak Premium Teak Oil applied to the furniture will help maintain that look. Apply a small amount of teak oil on a soft rag and rub onto a clean & dry teak product. After you have oiled the product wipe again with a clean dry rag to remove excess oil. The oil is meant to penetrate the wood not sit on top. Follow the instructions on the teak oil bottle. If your furniture has turned silver-gray from weathering in the shower or sun; you may choose to restore the finish. 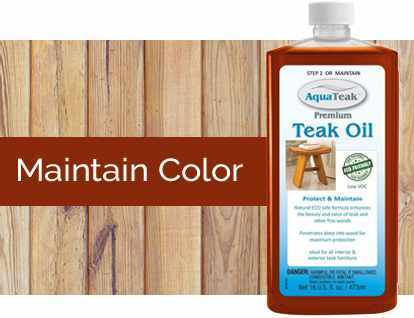 You must first remove the thin weathered layer by using AquaTeak Cleaner & Brightener before applying teak oil. As the wood weathers, you may notice small cracks, this is called "checking". This is normal and in no way affects the stability and integrity of the furniture. Teak wood is naturally a very durable wood that is waterproof and weather resistant. When the wood is fresh, it may appear to be a golden color. However, over time, young teak wood darkens to a rich mocha color. Color change is natural and does not indicate that there is a problem but speaks to its authenticity. Because of its natural oils, teak furniture is a very low-maintenance wood, even under exposure. However, over time, you may notice that your teak wood furniture does not have the same brilliant sheen. Not to fret, you can easily restore the brilliant color and shine with a few simple steps. Caring for your teak furniture is fairly simple and does not require these performance steps to be completed unless your teak appears dull or dingy. Rinse after use. For shower, bath, or spa furniture, rinse away soap residue and body oils after each use. For patio furniture, rinse regularly, especially after storms. For poolside furniture, rinse chlorinated pool water off furniture regularly. Wash with soap and water to remove soap or chlorine. 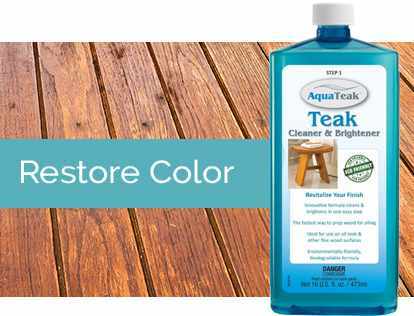 Use AquaTeak® Cleaner and Brightener if the teak is excessively dirty or has taken on a grey or black tint. Teak furniture is incredibly easy to maintain, just be sure you are doing it correctly! Don’t overclean or over-oil your teak furniture — only do clean and oil if it appears dull or dingy. Never use a metal brush or scrub against the wood grain. Do not use wood seal or stain. Don’t toss weathered teak furniture, use the steps above to make it new again! To learn more about caring for your high-quality teak wood furniture, read our articles: How to Take Care of Your Teak Wood Patio Furniture and How Do I Care For My Teak Wood Furniture?